By using Troy MICR Cheque Printers in conjunction with APACS approved Cheque Paper, InstaCheque can securely print your company's cheques quickly and efficiently. The blank 'Cheque Stock' contains numerous security features such as the Hologram and UV Fugitive with three security inks. 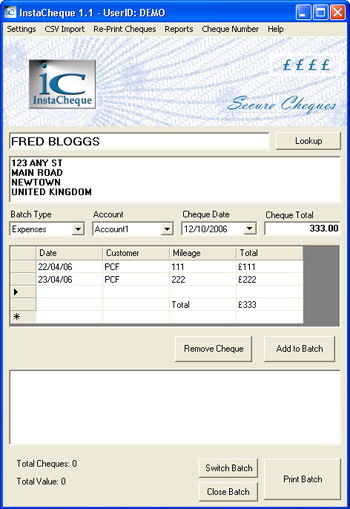 Two types of cheques can be produced using the manual cheque entry environment. The 'Letter' cheque uses a variable paragraph that can be edited and applied to the cheque batch or edited on-the-fly as a cheque is produced, or the remittance cheque. InstaCheque uses its own built-in security to control which users can print cheques. Administrators can be emailed automatically whenever a user prints a batch or fraudulent activity is detected. Also fully encrypted security logs record every user's activities. Call Us For Fast, Friendly & Impartial Advice on your cheque & security cheque requirements.